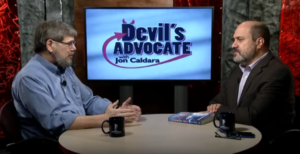 So earlier this month I was interviewed by Jon Caldera for his TV show “Devil’s Advocate”. The clip is up on YouTube. We chatted about science fiction in general and about indie publishing, but he did plug my books. Caldera is a science fiction fan from way back, I had fun. It’s only twelve minutes, so not very in-depth. Maybe it will lead to more.